The Moehau Kiwi Sanctuary is a haven for kiwi and native biodiversity due to the collective efforts of community conservation groups such as MEG and support from DOC. It is with heavy hearts and anger in our bellies that we can confirm to you all today that we have recently found the remains of 8 adult kiwi in the Moehau Kiwi Sanctuary area. Most of these birds have been fitted with transmitters as they are part of our breeding programme. In some cases the transmitters have been cut from the dead birds. DNA testing has so far confirmed that 5 of the 8 deaths are from dog, 1 case is still awaiting results and another returned inconclusive due to lack of sample. These are the birds we know about, how many others that aren’t monitored have been killed? We will be conducting DNA tests on local dogs and urge everyone that resides in the area to take part. If you see an unsupervised dog in the area please call the DOC Hotline 0800 DOC HOT (0800 362 486) to report. 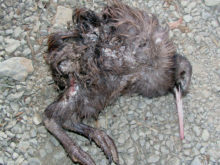 Our population of Coromandel Brown Kiwi is being decimated – please keep your dogs under control at all times.